You must enter a total quantity AND enter how many of each you want in the text field. Black conductive dots are for rubber keypads with black conductive pads. Metal snap domes 5D & 4D are only for replacing bad metal snap domes. 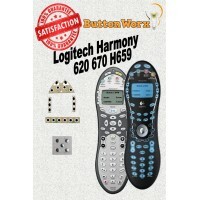 Do-It-Yourself fix for Logitech Harmony 620 H659 and 670 universal remotePermanent Button RepairPeel..